37 1/2 year career with the Wisconsin Department of Transportation. He began his career in 1964 working in the Hill Farms building at the Registrations Counter for the old Department of Motor Vehicles. Over his 37 year career he also worked in the Reciprocity Area and eventually the Voluntary Transfers section for 25 years assisting the State Patrol with fake registrations. In 1970, the Department of Motor Vehicles became the Department of Transportation. Ralph worked in the Hill Farms building his entire career with WDOT. 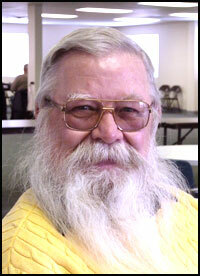 Ralph was a proud member of AFCSME and served as the Local Chapter 68 unions president from 1994-2001. He is an active member of their retiree group. He is also the current president of the Department of Transportation's retiree group. Ralph was in the active military for 2 years, is a Vietnam veteran and served in the Reserves for 19 years. He resides in the Black Earth area where he served as a local Emergency Medical Technician for many years. At one time he had a private pilot's license and has 46 hours of helicopter time. Since retiring Ralph enjoys playing Euchre with friends and has always been interested in restoring old trucks and cars. He is currently restoring an old Ford 8N tractor.